The Maturity Model Guidance Series is produced to support the Maturity Model for the Development of Professional Accountancy Organisations publication. The Maturity Model is a support tool that allows professional accountancy organisations (PAOs) to take a systematic approach to their organisational development, helping them make decisions and carry out their commitment to excellence, easily tracking their progress along the way. The Maturity Model comprises sixteen key success areas (KSAs) across four broad characteristics, which are presented around outside of the model as sustainability, relevance, professionalism and member value. Investigation and discipline is included as a KSA under “professionalism”. A credible accounting profession, built on integrity and quality, requires a strong system of investigation and discipline in order to appropriately administer consequences to members of the profession who do not behave in an ethical and professional manner. A trusted investigation and discipline (I&D) system is a necessary feature for any PAO in order to encourage and maintain a strong accountancy profession. This guide provides the “why”, “what” and “how” for an I&D system, and provides some tools, templates and examples to assist with implementation. Primarily aimed at PAOs without established or mature I&D systems, this guide focuses on practical guidance to achieve the minimum requirements for a working system. However, in order to recognise that any I&D system will involve ongoing challenges and complexities, and to provide aspirational content, a section on considerations for advanced systems is included. Other authorities with any I&D responsibilities over professional accountants will also find this guide useful. Watch the following video or read this flyer for a brief introduction about the I&D guide. 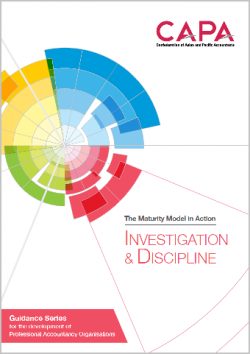 Investigation & Discipline Introduction Video from CAPA Ltd. on Vimeo. Note: The I&D guide is provided for use and reference at no charge to any professional accountancy organisation and other relevant organisations. However, written permission from CAPA is required to reproduce, store, transmit or make other similar uses of the materials contained in the guide, both in printed or digital formats and by electronic links. Contact the CAPA Secretariat for permission.